When it comes to selling your home , you’ve probably thought of the most common staging tricks, such as clearing out the clutter to make your rooms look bigger and bringing in more light to brighten things up. However, have you considered that the colors in your house might affect whether buyers are interested? First impressions are everything when you are selling a house, so think about how the colors you choose will likely influence your potential buyers. A new coat of paint could be a simple and effective way to make your house more appealing. When a potential buyer is looking at your house, they want to be able to imagine themselves living there. If your walls are painted in lime green or hot pink, it can be difficult for a buyer to relate the house to their own tastes. Instead, use neutral colors, such as cream, olive, beige and ivory. Then the walls become a blank canvas where prospective buyers can project their own style preferences. In order to make a space within your home feel larger, you can use a very light neutral color such as white, tan or pale grey. This will reflect more light and give the impression of a more expansive interior. You can also try painting the moldings the same color as the walls, which will make the ceilings look higher. It’s easy to focus on the interior of a house and forget about the outside, but the front of the house is the first thing potential buyers will see. Curb appeal can be a huge factor in their decision. One important word of caution regarding the paint in your home is the issue of lead-based paint. Lead-based paint was most common in homes built or painted prior to 1978. If your home falls in that age category, it may require further testing to ensure that the paint covering your walls is free of lead. Color has a psychological effect on people, whether they are aware of it or not. 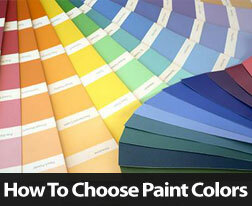 You’ll be amazed at the difference the right colors can make in selling or improving your home. If you would like more home staging and selling tips, please contact your trusted real estate professional today!